Held in Little Bay, the event showcased a series of projects which demonstrated excellence in design and development in Randwick. 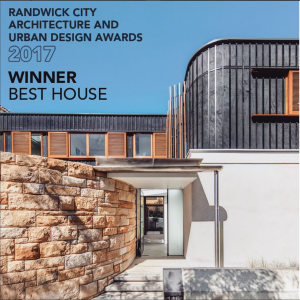 The awards recognise excellence and inspire better building design by promoting community awareness and acknowledging the architects and designs involved in enhancing Randwick City’s build environment. We are humbled to announce that our Eurhythms House has been selected as the recipient for this years ‘Best House’. Our Coogee family home is a showcase of refined details, elegant concoctions of materials and textures. The unification of existing heritage elements and modern insertion is another core aspect of the project we wanted to highlight. Firstly, as a firm we strive to create lasting architecture which responds best to the needs of the site and the needs and wants of the lifestyle and personality of the inhabitant. To be recognised for our work in the suburb that we love is something that we hold in high regard. Furthermore, to be able to continue to contribute to improving urban development and showcasing the importance of bespoke design. Finally, we would like to thank our contributors for helping this become a realisation. The trades and contractors involved showed skill and refinement in their finished work. Most noteworthy, on behalf of Alex Roth and Roth Architecture, we would like to thank the judges, Council Members and Mayor Lindsay Shurey. We thank them for their efforts in hosting the awards and in addition the acknowledgement of the importance of urban and architectural design development. The bespoke steel letterbox at the entry gives a clear clue that every part of this new house has been carefully designed and detailed. The materials range from rough face sandstone, to black stained plywood, smooth concrete floors, white painted timber and textured rendered walls. Natural light is introduced from above in many places which keeps the interiors fresh and bright. The form and placement of the house on the site has been cleverly negotiated to both respect the existing neighbour and maximize the site opportunities. The outcome of building along the northern boundary and facing the main length of the house west was not the obvious solution to this site, yet it is based on sound reasoning and has led to a better outcome. Shading to the west has mitigated the impact of the sun and provided extra interest to the street through the play of light, shadow and texture. Excerpt by Judges, Andrew Nimmo, Angelo Candalepas and Tanya Vincent.